ETI0001-1233 is being used by Naval Surface Warfare Center as thepower source for critical ship controls because of the stringent performanceand reliability requirements. The heavy-duty chassis, occupying only 5.25”(3U) for the electronics and 3.5" (2U) for the battery module by 23.5” depth, has rounded metal corners and rugged handles frontand rear, aiding in safe handling. Internally, all major components are wellsecured and electrically insulated to prevent damage due to shock andvibration. ETI0001-1233 accepts two independentAC power sources and includes inrush current limiting. TheUPS can operate from either power source automatically and does not use itsbattery unless both sources have failed. ETI0001-1233 has theadded benefit of having an internally redundant 28 VDC DC power source output. The LED arrays keep the operatorinformed as to the unit's status including load and battery levels. Thehigh intensity audible alarm can be heard in high noise environments. Allcontrols and protective devices are brought to the front and rear panels with criticalswitches having finger guards. Further, all front panel devices are recessed toprevent damage or accidental operation. Theinput switch and the galvanic isolation transformerall provide a double pole isolated source for all installations including shipboard systems oroverseas locations where phase references and grounding are not consistent. The rear panel provides locking connectors for the inputand output power. Removable and washable air filters and a high capacitystainless steel ballbearing fan provide added protection in both controlled and hostileenvironments. The exhaust air is diverted out the front vents, withalternate air flow directions optional. The external battery connector allows the safe and easy addition ofthe standard or extra battery modules without having to shut the unit down.The batteries are maintenance free with immobilized electrolyte and areconstructed of flame retardant materials. For more information, see the BatteryTechnology section. TheStatus connector provides an interface with optional computer softwareproviding loss of AC and low battery status as well as remote shut downcapability. ETI0001-1233AA for a newer upgraded version of this unit that is totally backward compatible.See the Power Distribution Units section for alisting of stand alone PDUs. 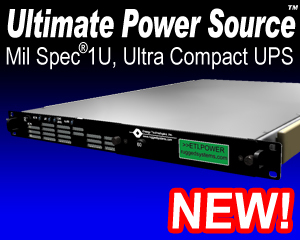 See the N5 Series section forversions of UPS with an integrated PDU and remote control. Overall, the Rugged Power line is uniquely qualified for criticalshipboard, vehicle, airborne or land based systems combining advanced modular designfeatures with highly reliable construction.